Life of the eminent Russian entomologist Georgii Georgievich Jacobson was hard and even tragic. Nevertheless, his contribution was tremendous, and he became a part of history of the Russian science forever. His scientific works are widely known, however, information about his personality is very scanty. He led secluded life, was modest and tried to be inconspicuous. G.G. Jacobson was born in St. Petersburg in 1871 into a family of a doctor of an orphanage. There were eight children in the family. His father died when he was quite young. He endured poverty in his youth, but nevertheless, in 1893, he graduated with honours from the Department of Natural Sciences of St. Petersburg University. In his student years he published his first works "Review of Tunicata of the White Sea", performed under the guidance of N.M. Knipowitsch, and two papers on systematics of dung beetles and leaf beetles. He became specialized in entomology, was particularly interested in the leaf beetles. As early as the 1900s he was an outstanding expert of the palaearctic fauna of this coleopterous family, including a large number of taxa, and very important in practical respect. After graduation from the University G.G. Jacobson for two years held position of "junior reserve forest warden" at the Ministry of State Property. At that time, under the guidance of I.Ya Shevyrev, who was among the first Russian forest entomologists, he studied forest pests, particularly bark beetles and also gypsy moth. For that purpose he made several trips to Middle Russia and Poland and discovered and described a species deducated to Vorontzov, an earlier unknown species damaging fir. In 1895 G.G. Jacobson began working at the Zoological Museum of the Academy of Sciences where he stayed until the end of his life, at first as a junior zoologist and later as a senior zoologist. In the 1890s and in the 1900s he traveled widely from Novaya Zemlya to Middle Asia. These trips resulted in the interesting work "Zoological Research in the Novaya Zemlya" (1898) and a large paper "Termites of Russia" (1904) the first serious investigation into Middle Asia termites, describing two most widely spread and having great economic importance species of this order from the fauna of Middle Asia -- Turkestanian and Large Transcaspian termites, an essay of their distribution, mode of life and practical importance were given. A second revised and expanded edition of this work came out in 1913. At the Zoological Museum G.G. Jacobson was first designated the Head of the Diptera Department. Since 1897 he also became the head of the Coleoptera Department. It was not until 20 years later that he was exempted from position of the Head of the Diptera Department. Although Diptera research was only a part of his duty his contribution in that area was quite important. G.G. Jacobson is known, first of all, as the author of two huge manuals in both size and amount of materials examined, which had an exceptional role in the development of entomology in Russia and up till present is regarded unsurpassed in scope and quality. The first of these "Orthoptera and Pseudoneuroptera of the Russian Empire" (1905) written by Jacobson in coauthorsip with another prominent zoologist V.L. Bianki (father of the well-known naturalist writer) was a monograph on the very diverse insects, which in the modern systematics are placed in a dozen of orders: may flies, dragon flies, orthopteroids, walking-sticks, cockroaches, mantids, termites, earwigs, stone flies, webspinners, psocids and, at last, caddis flies. That review was to a large extent a compilation of works of West European authors, however it included vast information on the Fauna of Russia collected by its authors and earlier unpublished. The review included particularly abundant faunistic data. The book contained 952 pages and 22 colour plates. It included excellent for that time keys to families and genera, information on all genera known at that time from Russia and neighbouring countries, lists of species indicated for fauna of that extensive region, information on their distribution. Bibliography was compiled very carefully. That publication resulted in more active research on the taxa touched upon in it, particularly on Orthoptera. B.P. Uvarov, an eminent expert on orthopterods in the 20th century, used to say that his way in science was defined by the book by Jacobson and Bianki. Even though during the nearly 100 years that passed since its publication much of its information bacame obsolete it still retains its significance as a reference book. The best known work by G.G. Jacobson, his huge monograph "Beetles of Russia, Western Europe and neighbouring countries", had an even greater role. It was based upon a huge unique catalogue established by G.G. Jacobson as a result of many years diligent work. It was supplemented by excellent knowledge of the order and literature concerning it. Fulfillment of this task appeared possible owing to G.G. Jacobson's exceptional capacity for work, his command of several languages, and also remarkable memory "wonderful memory in his young years and outstanding memory shortly before his death" as was stated in his obituary. This edition was published by issue. Initially it was assumed that it would comprise 12 issues, 96--128 pages in each. It was published by a well-known firm Devriena specialized in edition of science popular and geographic literature. G.G. Jacobson started working on this manual at the age of thirty and in 1905 the first two issues were published. They included a general part and beginning of the part on ground beetle family. The general part contained the major information on the order Coleoptera, chapters on structure of adult beetles and larvae, their mode of life, habitats, methods of collection, preparation and storage. The concise, but very good for its time chapter about species and other taxonomic categories and an essay of classification of beetles were of great value. Of the systems of the order proposed by that time G.G. Jacobson chose the most developed one (now it has become outdated). That system was used by L. Ganglbauer in his classical work on beetles of Middle Europe, which remained unfinished. The brief review of geographic distribution of Orthoptera was also informative. The major feature of general parts of was the excellent language: simple, clear and strictly scientific. G.G. Jacobson developed in detail Russian terminology on beetles. Each chapter of the general part was provided with skillfully selected bibliography, mostly foreign, although exhaustive list of relatively scanty by that time Russian literature was also provided. Of particular value were lists of the main faunistic literature on separate geographic regions and also a list of abbreviations for the major periodic editions and monographs. The general part was followed by the major systematic part. The most valuable part of it were keys for the identification of all known Palaearctic genera and a complete catalogue of species provided with the necessary bibliographic references. For every species detailed data were provided on its distribution and sometimes localities, subspecies and synonyms were listed. The general part of the book was illustrated with a large number of line drawings. The systematic part was illustrated by 83 coloured plates. They contained more than 2000 most characteristic beetles representing more than a half of all Palaearctic genera. Of these plates 48 were borrowed from a German manual (C. Schaufuss) and remaining 35 were performed specially for the book by Jacobson and were characterized by a high quality of drawings. The drawings were made by artist O. Somina, after whom G.G. Jacobson named a genus of leaf beetle Sominella. He named another genus Chekiniola after a technician Chekini who assisted him in his research. Both names had a certain meaning: Somina was tall and long-legged; Chekini was short and plump. Respectively the genus Sominella is distinguished among all close genera by elongated body and long legs and Chekiniola is characterized by short, rounded convex body. The first issues were printed mostly by normal type, brevier was used for bibliography only. Further the necessity to retain the size of edition made it necessary to use a more concise type and to use abbreviations more extensively. Lists of the 4th issue were typed using brevier. At the same time the amount of pages considerably exceeded the initial plan. By 1916 11 issues were published (a total of 1024 pages) and all plates. Meanwhile parts on nearly 30 more families, among those such important as scarabs, darkling beetles, long-horned beetles, leaf beatles and weevils were published. "Beetles of Russia" were published by one of the best St. Petersburg printing houses. At that time type-setting was performed from a hand-written manuscript; there was not requirement to submit several copies of typed manuscript. By 1917 Jacobson had completed the main text of his book. The only hand-written copy written in legible hand writing was in the printing house where it burnt in a fire, in 1917. That was a heavy blow for G.G. Jacobson. In the years that followed, during the civil war and the period of desorganization he had no possibility to restore the manuscript. Even if he had tried to restore the manuscript on the basis of the huge catalogue the manuscript would have been inevitably incomplete, because most of the scientific relations were broken off and G.G. Jacobson had no possibility to renew and supplement his catalogue and make amendments in the manuscript, as he had done for many years. However even unfinished and now even obsolete this remarkable book still retains the importance of the best Russian manual on beetles and it is constantly being used in everyday work. This work is also highly valued abroad. G.G. Jacobson endured one more heavy loss in summer 1919 when his elder brother and a closest friend Alexei Geogievich Jacobson (1869-1919) died of typhus. 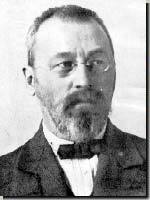 He also graduated from St. Petersburg University, and taught mathematics, physics and chemistry in many higher schools. At the same time he was interested in insects, was an expert in those and and was an excellent collector. He used his scanty funds for remote trips: to Altail, Tien-Shan, Pamir and in 1912 visited Kashmir, Xinjiang collecting vast materials on beetles. It should be added that G.G. Jacobson was very unhappy in his family life. In his student years he married a woman of easy morals. His intention was to save her to make her transformed into an honest woman, to help her get education. However his attempts were in vain. His wife turned out to be ill-natured and greedy. They had no children. G.G. Jacobson never invited his colleagues to his place and never visited his colleagues; it was a custom to be accompanied by a spouse when visiting somebody. G.G. Jacobson spent long hours in the Museum. He participated actively in the activities of the Russian Entomological Society. From 1909 till 1917 he was its Scientific Secretary and when the Department of Applied Entomology was established in 1921 he was elected its president and remained in that position until the end of his life. He spent much energy and affection on advising and teaching young entomologists, laymen, university students and even school students. In one obituary it was said that "he always lived for others rather than for himself", in in another it was stated that "he was unreasoning spending his time for others". Nearly all entomologists who worked in Russia in the 1st quarter of the 20th century were greatly influenced by G.G. Jacobson. Many of his former students died in the World War I and in civil war, others changed their specialty, although some continued studying entomology as laymen, e.g. N.N. Filippov (a future secret service agent) or V.B. Shavrov (designer of sea planes and historian of aviation). Serious entomological study was conducted by D.A. Ogloblin, who later became known as a specialist in leaf-eating beetles, and was successor of G.G. Jacobson, by A.N. Reikhardt and F.K. Lukyanovich. All of them died in 1942 in Leningrad during the Siege. Before that V.V. Barovsky was sent on exile, and later his traces were lost. By the early 1920s G.G. Jacobson was a tired disappointed man. His main work remained unfinished. Even if he had succeeded in writing it again there was no hope for publication. He continued working at the Zoological Museum, a box after box bringing into order the collection of the Coleptorological Department helping younger staff members. He was also conducting labour-consuming, though necessary work in deciphering of lables. During those years he published several important papers on systematics and faunistic studies of his favourite leaf beetles. G.G. Jacobson's wife reconciled with him as a long in the prerevolutionary years he could support her well-being. However, when, during the revolution and after the revolution he, like the majority of scientists in St. Petersburg, was enduring poverty and starvation, their joint life became unbearable. His wife demanded that he should start black marketing or that they should move together to Estonia (where she came from) to help her brother, a pork butcher. In order to earn more G.G. Jacobson since 1921 became a part-time lecturer in entomology at the Agricultural Institute in Petrograd. His teaching, as usual, was characterized by conscientiousness and profundity. In 1924 the well-known specialist in agricultural entomology and organizer of plant proteciton N.N. Bogdanov-Katkov proposed G.G. Jacobson to write a key for the identification of beetles based upon the fauna of European Russia and intended for a relatively wide range of readers. Editions of that scope had not yet existed. The keys that had been published and translated did not cover our fauna and could not provide reliable identification. At that time Jacobson was the only person in Russia capable of coping with that task and he undertook that challenge. Meanwhile the situation in his family was growing worse. However G.G. Jacobson did not let anyone know that he was on the verge of ruin. When the manuscript of the key was completed in the morning of 23 November 1926 G.G. Jacobson left a note that he had no purpose to live for and poisened himself by potassium cyanide. He was 55. In December 1926 the Russian Entomological Society held a meeting dedicated to the memory of G.G. Jacobson. A.P. Semenov-Tian-Shansky, N.Ya. Kuznetsov, M.N. Rimsky-Korsakov, V.L. Bianki, N.N. Bogdanov-Katkov made speaches at that meeting. In 1928 their speeches were published in the "Russian Entomological Review" and are now the major source of information about G.G. Jacobson. G.G. Jacobson's "Key to beetles" was published twice, in 1927 and 1931. The second edition was slightly supplemented by Ogloblin. It was used by several generations of entomologists and it became the basis for all subsequent Russian keys. Other books and papers of G.G. Jacobson are still used.